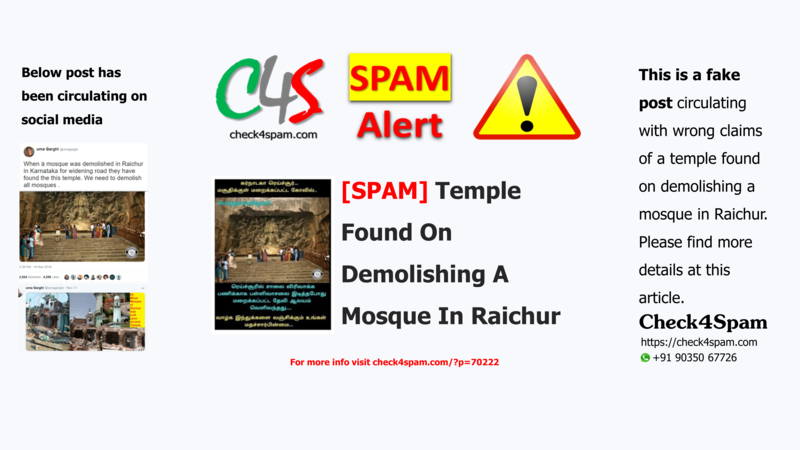 Temple found on demolishing a Mosque in Raichur is a fake post circulating on social media. Please find details in this article. There are various clues in both images. Look at the cuts on the roof that covers the statues. Off course the logo says it all that is mentioned on the first image. Structure of the image is very similar. Above all the Creator himself clarifies that the first image as his creation using second image as inspiration. Read more about Artist Chandra Colourist. “We have partially cleared structures on either side of the stretch to make it a 50-ft wide road. Most of the cleared structures were commercial shops. No residential structure was there to be demolished. One mutt and two masjids were also partially demolished. A day earlier, we had a meeting with Ek Minar masjid authorities who agreed to the partial demolition of the masjid. Today, another group came and objected to it,” Mr. Senthil told The Hindu.